Match ends, Sky Blue 1, Western New York Flash 2. Second Half ends, Sky Blue 1, Western New York Flash 2. Attempt missed. Kelley O'Hara (Sky Blue) right footed shot from the right side of the box is too high. Assisted by Sarah Killion. 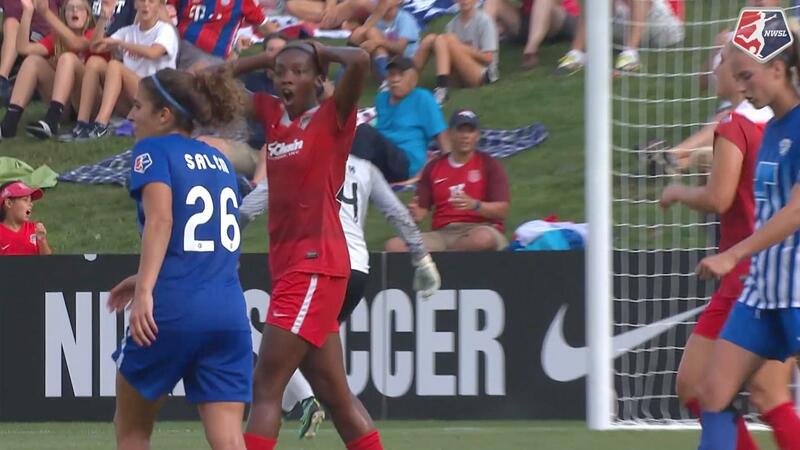 Kristen Hamilton (Western New York Flash) is shown the yellow card for a bad foul. Foul by Kristen Hamilton (Western New York Flash). Attempt saved. Kelly Conheeney (Sky Blue) right footed shot from long range on the left is saved in the top centre of the goal. Assisted by Natasha Kai. Corner, Sky Blue. Conceded by Sabrina D'Angelo. Attempt saved. Danielle Schulmann (Sky Blue) right footed shot from the centre of the box is saved in the top right corner. Assisted by Kelley O'Hara with a cross. Corner, Sky Blue. Conceded by Kristen Hamilton. Danielle Schulmann (Sky Blue) wins a free kick on the right wing. Goal! Sky Blue 1, Western New York Flash 2. Samantha Mewis (Western New York Flash) left footed shot from the centre of the box to the bottom left corner. Attempt saved. Jessica McDonald (Western New York Flash) header from the centre of the box is saved in the top centre of the goal. Assisted by Jaelene Hinkle with a cross. Attempt blocked. Michaela Hahn (Western New York Flash) right footed shot from outside the box is blocked. Assisted by Kristen Hamilton. Substitution, Western New York Flash. Kristen Hamilton replaces Taylor Smith. Offside, Western New York Flash. Sabrina D'Angelo tries a through ball, but Jessica McDonald is caught offside. Attempt missed. 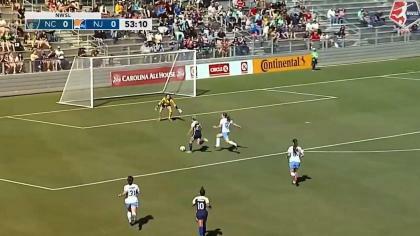 Kelly Conheeney (Sky Blue) right footed shot from outside the box is too high. Assisted by Natasha Kai. Danielle Schulmann (Sky Blue) wins a free kick on the left wing. Substitution, Sky Blue. Danielle Schulmann replaces Raquel Rodríguez. Goal! Sky Blue 1, Western New York Flash 1. Jaelene Hinkle (Western New York Flash) converts the penalty with a right footed shot to the bottom left corner. Caroline Stanley (Sky Blue) is shown the yellow card. Substitution, Western New York Flash. Michaela Hahn replaces Adriana Leon. Substitution, Western New York Flash. Makenzy Doniak replaces Jeon Ga-Eul. Attempt saved. Raquel Rodríguez (Sky Blue) right footed shot from outside the box is saved in the top right corner. Assisted by Nikki Stanton. Attempt saved. Jaelene Hinkle (Western New York Flash) right footed shot from outside the box is saved in the bottom left corner. Kelly Conheeney (Sky Blue) wins a free kick on the left wing. Attempt saved. Elizabeth Eddy (Western New York Flash) left footed shot from long range on the right is saved in the top centre of the goal. Assisted by Alanna Kennedy. Attempt missed. 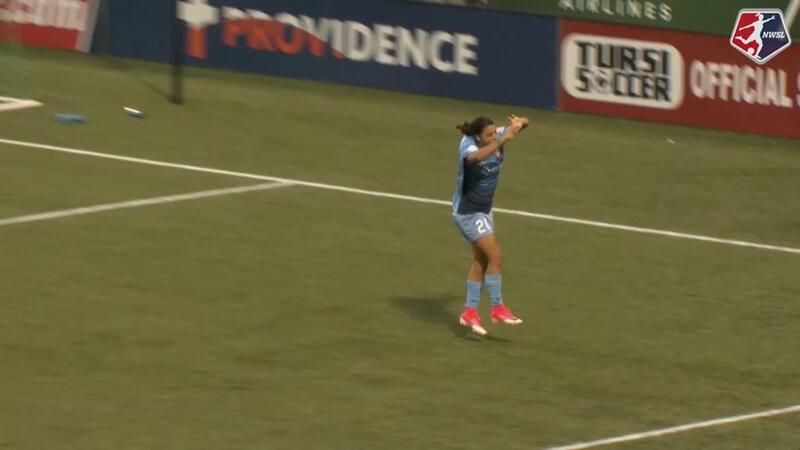 Kelley O'Hara (Sky Blue) right footed shot from outside the box is close, but misses to the left. Assisted by Maya Hayes. Attempt saved. Raquel Rodríguez (Sky Blue) left footed shot from outside the box is saved in the bottom right corner. Assisted by Taylor Lytle. Attempt missed. Jessica McDonald (Western New York Flash) header from the centre of the box is close, but misses to the right. Assisted by Jaelene Hinkle with a cross following a set piece situation. Jeon Ga-Eul (Western New York Flash) wins a free kick on the left wing. Offside, Sky Blue. Nikki Stanton tries a through ball, but Natasha Kai is caught offside. Adriana Leon (Western New York Flash) wins a free kick in the defensive half. Second Half begins Sky Blue 1, Western New York Flash 0. First Half ends, Sky Blue 1, Western New York Flash 0. Attempt missed. Samantha Mewis (Western New York Flash) right footed shot from outside the box is just a bit too high from a direct free kick. Samantha Mewis (Western New York Flash) wins a free kick in the attacking half. Attempt missed. Nikki Stanton (Sky Blue) right footed shot from outside the box is too high. Attempt blocked. Taylor Lytle (Sky Blue) right footed shot from outside the box is blocked. Assisted by Raquel Rodríguez. Attempt saved. Alanna Kennedy (Western New York Flash) left footed shot from outside the box is saved in the centre of the goal. Foul by Jeon Ga-Eul (Western New York Flash). Goal! Sky Blue 1, Western New York Flash 0. Maya Hayes (Sky Blue) right footed shot from the right side of the box to the bottom left corner. Assisted by Raquel Rodríguez with a through ball. Attempt missed. Raquel Rodríguez (Sky Blue) right footed shot from outside the box is too high. Attempt blocked. Sarah Killion (Sky Blue) right footed shot from outside the box is blocked. Assisted by Taylor Lytle. Attempt blocked. Adriana Leon (Western New York Flash) right footed shot from outside the box is blocked. Assisted by Jeon Ga-Eul. Attempt missed. Samantha Mewis (Western New York Flash) left footed shot from outside the box is just a bit too high. Assisted by Alanna Kennedy. Corner, Western New York Flash. Conceded by Christie Rampone. Offside, Sky Blue. Natasha Kai tries a through ball, but Maya Hayes is caught offside. Attempt blocked. Jessica McDonald (Western New York Flash) right footed shot from the centre of the box is blocked. Attempt blocked. Taylor Smith (Western New York Flash) right footed shot from the left side of the box is blocked. Jeon Ga-Eul (Western New York Flash) wins a free kick on the right wing. Attempt missed. Taylor Smith (Western New York Flash) right footed shot from outside the box is too high. Attempt saved. Samantha Mewis (Western New York Flash) left footed shot from outside the box is saved in the bottom left corner. Assisted by Alanna Kennedy. Attempt saved. Kelley O'Hara (Sky Blue) right footed shot from the right side of the box is saved in the top centre of the goal. Assisted by Sarah Killion. Attempt missed. Natasha Kai (Sky Blue) header from the centre of the box misses to the right. Assisted by Christie Rampone.